https://www.tradingdepot.co.uk/bette-super-flat-shower-tray-35mm-x-1200mm-x-1100mm 26846 Bette Super Flat Shower Tray - 35mm x 1200mm x 1100mm https://www.tradingdepot.co.uk/media/catalog/product/8/6/8630-000_4.jpg 419.73 419.7300 GBP OutOfStock /Bathroom/Shower Trays/Shower Trays By Shape/Rectangular Shower Trays /Brands/Bette/Bette 3.5cm Super Flat Shower Trays Bette Super Flat 3.5mm Shower Tray in white is a member of the Bette Super Flat Range. 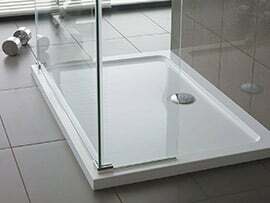 This 1200 x 1100 Rectangular Flat Top Shower Tray is part of the Super Flat Range. It has a steel surface, with a 90mm Waste hole (waste not included). includes low mounting heights which also makes the tray suitable for renovations and older buildings. Bette offers a 30 year guarantee providing customer peace of mind.